Born in 1967, Kuen Stephanie started in the art industry after she graduated from her Diploma in Commercial Art from the Malaysian Institute of Art in 1987 where she has established herself as one of Malaysia’s fine artists. She started working on fine art painting around 2000 where she is known to use rice textures of the society where she grew up with. Here works are known to exude the multi-cultural rural life of the country, which is what it is very rich in. Kuen’s work is very colourful where she is known to use the Nyonya theme in her images and objects. The self-taught figurative artist have used her techniques and unique styles where her paintings provide a warm reception for the viewer. Encircling around the themes and motifs of family life, society and such, Kuen’s work has been exhibited in galleries in Malaysia and Singapore. Her works were also published into a calendar due to their colourful nature and close relation to the Malaysian culture. She was involved in a recent show entitled ‘Peranakan in Plays’ which was jointly exhibited with Lim Leong Seng at the Dahlia Gallery LLP in Singapore. She also previously had solo exhibitions entitled ‘Citra Warna Malaysia’ as well as ‘The Peranakan Palate: Feasting on Beauty’ shows respectively. Kuen’s paintings are very unique and this is very much exuded in her own style and techniques. Her use of colours which are contrasting and loud works very well in her favour especially if she tries to inject the sense of locality in her works. 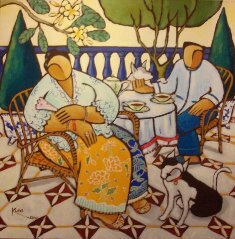 As seen in the painting above entitled ‘Out in the Garden’, Kuen has successfully imposed the idea of the typical kampong style environment which is a common sight in such places. The details of the painting can be clearly seen and Kuen’s depiction of the expression of the people here are very local and clearly visible. In Kuen’s ‘Nyonya Series’, she painted various types of motifs of the Nyonya in different outfits and colour schemes. 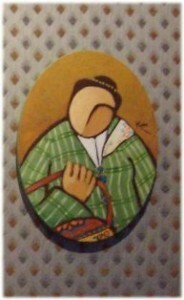 The Brown series is seen here where Kuen used texture and again her own trademarked expression on the face of the person has been adopted. This is and remains as the most original traits of Kuen’s work which can be clearly seen in all her paintings. This represents very much her character as well as the way she presents her work which provides the viewer with a very special type of experience. It gives the person an impression and the freedom to make up their own expressions in the paintings.